Frankfurt, officially Frankfurt am Main (Literally "Frankfurt on the Main", [ˈfʁaŋkfʊɐ̯t am ˈmaɪ̯n]), is a metropolis and the largest city in the German state of Hesse and the fifth-largest city in Germany, with a 2015 population of 732,688 within its administrative boundaries, and 2.3 million in its urban area. The city is at the centre of the larger Frankfurt Rhine-Main Metropolitan Region, which has a population of 5.5 million and is Germany's second-largest metropolitan region after Rhine-Ruhr. Since the enlargement of the European Union in 2013, the geographic centre of the EU is about 40 km (25 mi) to the east of Frankfurt's CBD, the Bankenviertel. Frankfurt is culturally and ethnically diverse, with around half of the population, and a majority of young people, having a migration background. A quarter of the population are foreign nationals, including many expatriates. 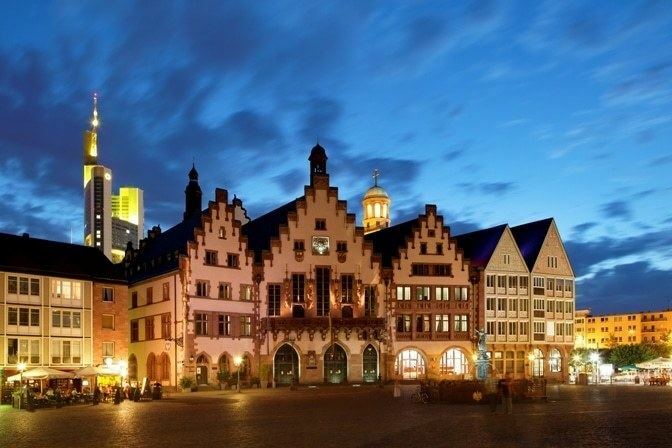 Frankfurt is an alpha world city and a global hub for commerce, culture, education, tourism and transportation. It's the site of many global and European corporate headquarters. Frankfurt Airport is among the world's busiest. 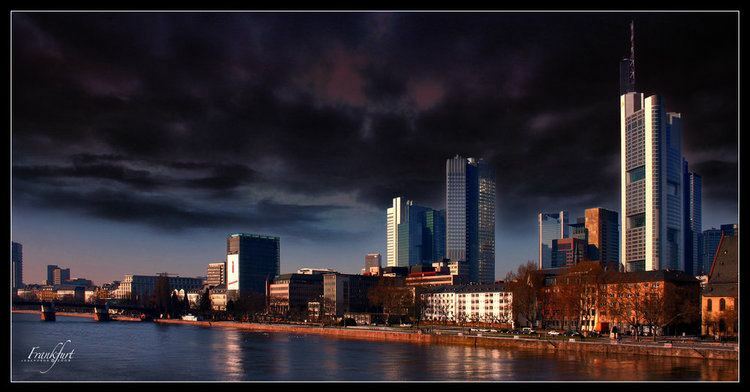 Frankfurt is the major financial centre of the European continent, with the HQs of the European Central Bank, German Federal Bank, Frankfurt Stock Exchange, Deutsche Bank, Commerzbank, DZ Bank, KfW, several cloud and fintech startups and other institutes. Automotive, technology and research, services, consulting, media and creative industries complement the economic base. Frankfurt's DE-CIX is the world's largest internet exchange point. Messe Frankfurt is one of the world's largest trade fairs. Major fairs include the Frankfurt Motor Show, the world's largest motor show, the Music Fair, and the Frankfurt Book Fair, the world's largest book fair. 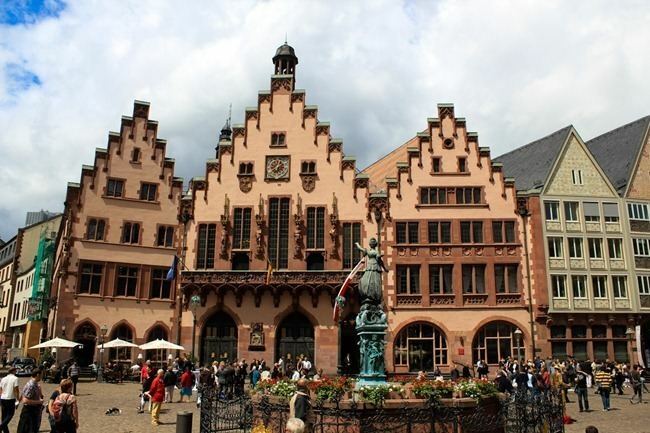 Frankfurt is home to influential educational institutions, including the Goethe University, the UAS, the FUMPA, and graduate schools like the Frankfurt School of Finance & Management. Its renowned cultural venues include the concert hall Alte Oper, Europe's largest English Theatre and many museums (e.g. the Museumsufer ensemble with Städel and Liebieghaus, Senckenberg Natural Museum, Goethe House), the Schirn art venue at the old town. Frankfurt's skyline is shaped by some of Europe's tallest skyscrapers. The city is also characterised by various green areas and parks, including the central Wallanlagen, the City Forest and two major botanical gardens, the Palmengarten and the University's Botanical Garden. In electronic music, Frankfurt has been a pioneering city since the 1980s, with renowned DJs including Sven Väth, Marc Trauner, Scot Project, Kai Tracid, and the clubs Dorian Gray, U60311, Omen and Cocoon. In sports, the city is known as the home of the top tier football club Eintracht Frankfurt, the basketball club Frankfurt Skyliners, the Frankfurt Marathon and the venue of Ironman Germany. It's the seat of German sport unions for Olympics, football and motor sports. In 2010, 63 national and 152 international banks had their registered offices in Frankfurt, including Germany's major banks, notably Deutsche Bank, Commerzbank, DZ Bank and KfW, as well as 41 representative offices of international banks. Frankonovurd (in Old High German) or Vadum Francorum (in Latin) were the first names mentioned in written records from 794. It transformed to Frankenfort during the Middle Ages and then to Franckfort and Franckfurth in the modern era. According to Czech historian Dovid Solomon Ganz, the city was named c. 146 AD by its builder, a Frankish king named Zuna, who ruled over the province then known as Sicambri. He hoped thereby to perpetuate the name of his lineage. The name is derived from the Franconofurd of the Germanic tribe of the Franks; Furt (cf. English 'ford) where the river was shallow enough to be crossed on foot. The suffix 'am Main' has been used regularly since the 14th century. In English, the city's full name of Frankfurt am Main means 'Frankfurt on the Main' (pronounced like English 'mine' or German mein). Frankfurt is located on an ancient ford (German: Furt) on the Main River. As a part of early Franconia, the inhabitants were the early Franks, thus the city's name reveals its legacy as "the ford of the Franks on the Main". In the Napoleonic Wars, Frankfurt was occupied or bombarded several times by French troops. It remained a free city until the collapse of the Holy Roman Empire in 1805/6. In 1806, it became part of the principality of Aschaffenburg under the Fürstprimas (Prince-Primate), Karl Theodor Anton Maria von Dalberg. 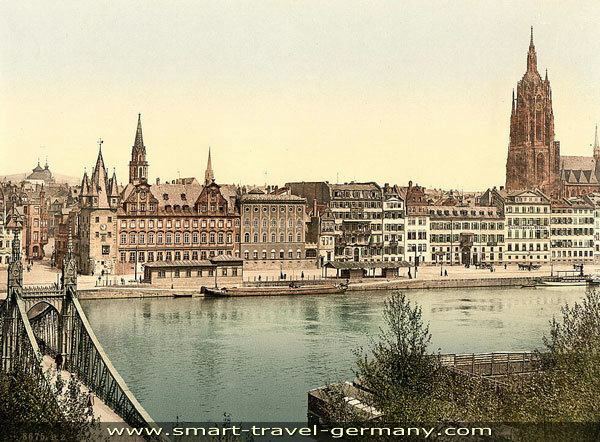 This meant that Frankfurt was incorporated into the confederation of the Rhine. In 1810, Dalberg adopted the title of a Grand Duke of Frankfurt. Napoleon intended to make his adopted son Eugène de Beauharnais, already Prince de Venise ("prince of Venice", a newly established primogeniture in Italy), Grand Duke of Frankfurt after Dalberg's death (since the latter as a Catholic bishop had no legitimate heirs). The Grand Duchy remained a short episode lasting from 1810 to 1813, when the military tide turned in favour of the Anglo-Prussian lead allies that overturned the Napoleonic order. Dalberg abdicated in favour of Eugène de Beauharnais, which of course was only a symbolic action, as the latter effectively never ruled after the ruin of the French armies and Frankfurt's takeover by the allies. After Napoleon's final defeat and abdication, the Congress of Vienna (1814–1815) dissolved the grand-duchy, and Frankfurt entered the newly founded German Confederation (till 1866) as a free city, becoming the seat of its Bundestag, the confederal parliament where the nominally presiding Habsburg Emperor of Austria was represented by an Austrian "presidential envoy". Frankfurt lost its independence after the Austro-Prussian War in 1866 when Prussia annexed several smaller states, among them the Free City of Frankfurt. Frankfurt had stayed neutral in the war, but its free press bothered the Prussians and they used the opportunity to occupy the city by force: Bismarck had been an ambassador to the German Confederation there and constantly quarrelled with the local press. The Prussian administration incorporated Frankfurt into its province of Hesse-Nassau. The formerly independent towns of Bornheim and Bockenheim were incorporated in 1890. With a population of 732.688 (2015) within its administrative boundaries and of 2,300,000 in the actual urban area, Frankfurt is the fifth largest city in Germany after Berlin, Hamburg, Munich and Cologne. Central Frankfurt has been a Großstadt (a city with at least 100,000 residents by definition) since 1875. With 414,576 residents in 1910, it was the ninth largest city in Germany and the number of inhabitants grew to 553,464 before World War II. After the war, at the end of the year 1945, the number had dropped to 358,000. In the following years the population grew again and reached an all-time-high of 691,257 in 1963. It dropped again to 592,411 in 1986 but has increased since then. According to the demographic forecasts for central Frankfurt, the city will have a population up to 825,000 within its administrative boundaries in 2020 and more than 2.5 million inhabitants in its urban area. According to data from the city register of residents, 51,2 percent of the population had an immigrant background as of 2015. For the first time a majority of the city residents had a non-German background. Moreover, three of four children in the city under the age of six had immigrant backgrounds. Moreover, about 27,7 percent of residents had a foreign citizenship. The city is considered a multicultural city because it is home to people of 180 nationalities. The city contains sizable immigrant populations from Turkey, Croatia, Italy, Poland, Romania, Serbia, Bulgaria, Greece, Macedonia, Russia, Lebanon, Afghanistan, Bosnia and Herzegovina, Spain, Portugal, France, China, Japan, the United States, Austria, the United Kingdom, Pakistan, Morocco and India. 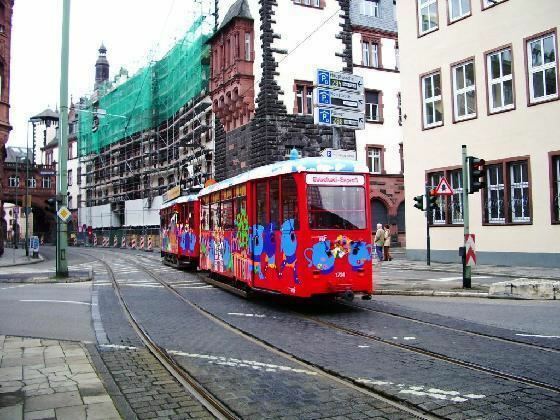 The Frankfurt urban area is also home to the second-largest Korean community in Europe, and to Germany's largest Sri Lankan Tamil community. As of 2013 the largest Christian denominations were Roman Catholicism (22.7% of the population) and Protestantism (19.4%). Estimations put the share of Muslim inhabitants at approximately 12% (2006). According to calculations based on census data for 21 countries of origin the number of Muslim migrants in Frankfurt amounted to about 84,000 in 2011, making up 12,6 percent of the population. A large part of them was from Turkey and Morocco. Over 7,000 inhabitants were affiliated with the Jewish community, amounting to approximately 1% of the population. "Römer" is the German word for "Roman" and the name of a complex of nine houses that form Frankfurt city hall (Rathaus). The houses were acquired by the city council in 1405 from a wealthy merchant family. The middle house became the city hall and was later connected with its neighbours. The Kaisersaal ("Emperor's Hall") is located on the upper floor and is where the newly crowned emperors held their banquets. The Römer was partially destroyed in World War II and later rebuilt. The surrounding square, the Römerberg, is named after the city hall. Saint Bartholomew's Cathedral (Dom Sankt Bartholomäus), (named after Bartholomew the Apostle), is a Gothic building constructed in the 14th and 15th centuries on the foundation of an earlier church from the Merovingian time. From 1356 onwards, kings of the Holy Roman Empire were elected in this church, and from 1562 to 1792, Roman-German emperors were crowned there. It is the city's main church. Since the 18th century, St. Bartholomew's has been called "the cathedral" by the people, although it was never a bishop's seat. In 1867 it was destroyed by fire and rebuilt in its present style. It was again partially destroyed in World War II and rebuilt in the 1950s. Its height is 95 meters. The cathedral tower has a viewing platform open to the public at a height of 66 meters, accessed through a narrow spiral staircase with 386 steps. Saint Paul's Church (Paulskirche) is a national historic monument in Germany because it was the seat of the first democratically elected Parliament in 1848. It was established in 1789 as a Protestant church, but was not completed until 1833. Its importance has its roots in the Frankfurt Parliament, which met in the church during the revolutionary years of 1848/49 in order to write a constitution for a united Germany. The attempt failed because the monarchs of Prussia and Austria did not want to lose power. In 1849 Prussian troops ended the democratic experiment by force and the parliament dissolved. Afterwards, the building was used for church services again. The Archaeological Garden contains small parts of the oldest recovered buildings: an ancient Roman settlement and the Frankfurt Royal Palace (Kaiserpfalz Frankfurt) from the 6th century. The garden is located between the Römerberg and St. Bartholomew's. It was discovered after World War II when the area was heavily bombed and later partly rebuilt. The remains were preserved and are now open to the public. There are plans underway to construct a building on top of the garden but anyhow it is decided that the garden will stay open to the public. The Eiserner Steg (Iron Bridge) is a pedestrian-only bridge over the Main river that connects Römerberg and Sachsenhausen. It was built in 1868 and was the second bridge to cross the river. 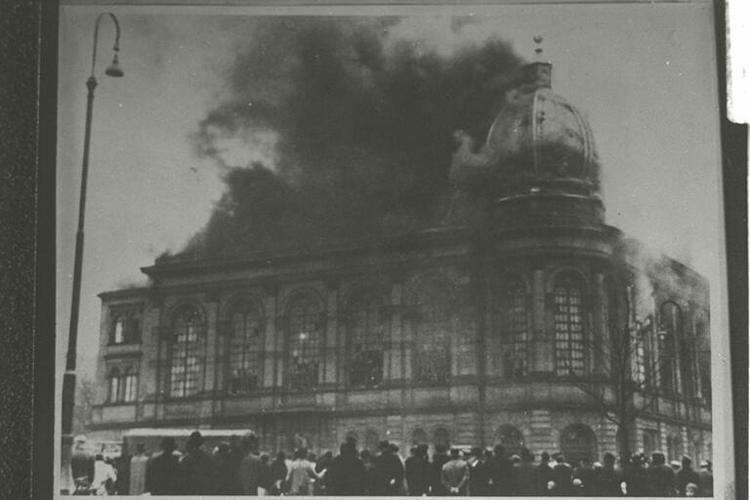 After World War II, when it was blown up by the Wehrmacht, it was quickly rebuilt in 1946. Today some 10,000 people cross the bridge on a daily basis. St. Catherine's Church (Katharinenkirche) is the largest evangelical church, dedicated to the martyred early Christian saint, Catherine of Alexandria. It is located in the city centre at the entrance to the Zeil, the central shopping street. Messeturm, 256.5 m (841.54 ft) – The European Union's tallest building (1990–1997), Main tenant is Goldman Sachs (Germany). Deutsche Bank II, 155.0 m (508.53 ft) – "
For centuries, St. Bartholomeus's Cathedral was the tallest structure. The first building to exceed the 95-metre-high cathedral was not an office building but a grain silo, the 120-metre high Henninger Turm, built from 1959 to 1961. Goetheturm — The Goethe Tower is a 43-metre high tower on the northern edge of the Frankfurt City Forest in Sachsenhausen. It is the fifth tallest wood construction structure in Germany. It was built in 1931 and is still a popular place for day-trippers, especially families, who frequent a large playground and café at the foot of the tower. Climbing the Goethe Tower is free of charge and offers a spectacular view of the Frankfurt skyline. 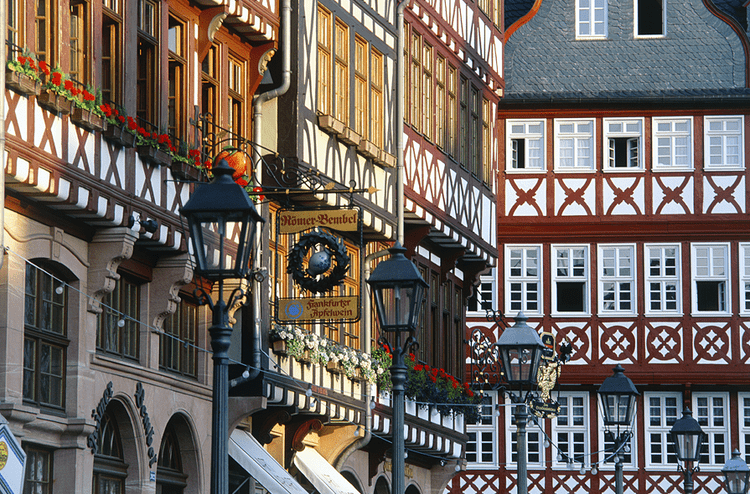 With more than 30 museums, Frankfurt has one of the largest variety of museums in Europe. 20 museums are part of the Museumsufer (Museums Riverbank), located on the front row of both sides of the Main riverbank or nearby. Luminale — The "festival of light" takes place biannually since 2000, parallel to the Light + building exhibition at the trade fair. Many buildings are specially lit for the event. In 2008, more than 220 light installations could be seen and attracted 100,000 visitors. The last Luminale was held in April 2012. Apfelwein – Apple wine or hard cider is regionally known as "Ebbelwoi", "Äppler" or "Stöffsche". It has an alcohol content of 5.5%–7% and a tart, sour taste. It is traditionally served in a glass, typically decorated with lozenges, called "Geripptes", a full glass is then called "Schoppen". Apfelwein is also available in a stoneware jar locally known as "Bembel". 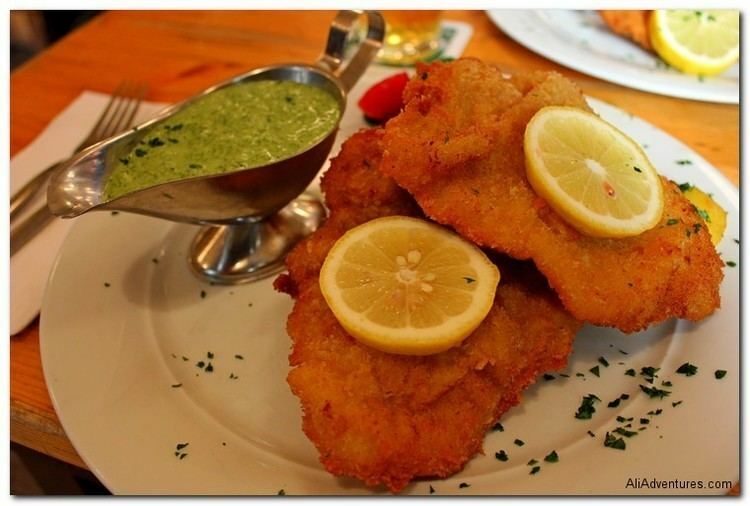 A group normally orders a "Bembel" and shares the content. Apfelwein can be ordered as "sauergespritzer", which is apfelwein blended with 30% mineral water or as "süssgespritzer", which is Apfelwein blended with lemon soda, orange soda or fresh-pressed apple juice (lemon soda being the most common). Most of the pubs which serve Apfelwein are located in Sachsenhausen, which is therefore known as "Ebbelwoi district". Due to its national drink Frankfurt is sometimes called "Big Ebbel" (pronunciation with hessian dialect), an homage to Big Apple, the famous nickname of New York City. 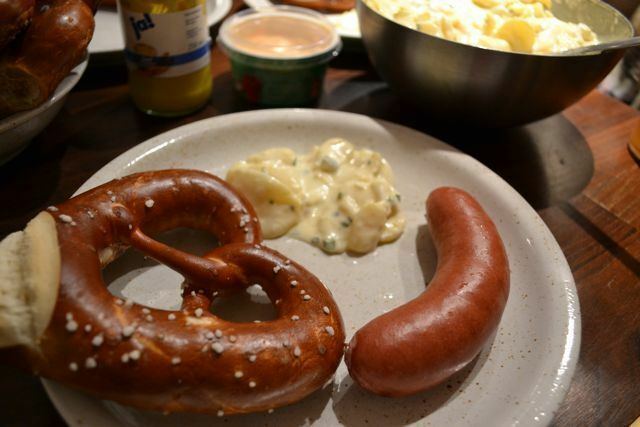 Frankfurter Würstchen – "short Frankfurter" is a small sausage made of smoked pork smoked. They are similar to Hot dogs. The name Frankfurter Würstchen has been trademarked since 1860. Uber ceased Frankfurt operations on 9 November 2015. It is unknown when services will resume. Frankfurt has a network of cycle routes. Many long-distance bike routes into the city have cycle tracks that are separate from motor vehicle traffic. A number of roads in the city centre are "bicycle streets" where the cyclist has the right of way and where motorised vehicles are only allowed access if they do not disrupt the cycle users. In addition, cyclists are allowed to ride many cramped one-way streets in both directions. As of 2015, 15 percent of citizens used bicycles. The European Central Bank (Europäische Zentralbank) is one of the world's most important central banks. The ECB sets monetary policy for the Eurozone, consisting of 19 European Union member states that have adopted the Euro (€) as their common currency. Since 1998 the ECB Headquarters are located in the Eurotower at Willy-Brandt-Platz and in two other nearby high-rises. The future Seat of the European Central Bank in the Ostend district, consisting of the former wholesale market hall (Großmarkthalle) and a newly built 185-metre skyscraper, were expected to be completed by early 2014. The new building complex was to accommodate up to 2,300 ECB personnel. The location is a few kilometres away from the city centre and borders an industrial area as well as the Osthafen (East Harbour), It was primarily chosen because of its large premises which allows the ECB to install security arrangements without high fences. Commerzbank — Germany's second-largest commercial, bank with total assets of €754 billion (2010). In 2009, Commerzbank merged with competitor Dresdner Bank, then the third-largest German bank. Due to the merger and the higher credit risks, Commerzbank was partially nationalized (25 percent) during the financial crisis in 2009. It is listed in the DAX. Its headquarters are at Commerzbank Tower (259 metres), the 2nd tallest building in the European Union, at Kaiserplatz. KfW Bankengruppe —Government-owned development bank formed in 1948 as part of the Marshall Plan. KfW provides loans for approved purposes at lower rates than commercial banks, especially to medium-sized businesses. With total assets of €442 billion (2010), it is Germany's third-largest bank. The KfW Headquarters are located in the Westend district at Bockenheimer Landstraße and Senckenberganlage. DZ Bank — Central institution for more than 900 co-operative banks (Volksbanken und Raiffeisenbanken) and their 12,000 branch offices in Germany and is a corporate and investment bank. It is Germany's fourth-largest bank (total assets: €383 billion). The DZ Bank Group defines itself primarily as a service provider for the local Volksbanken and Raiffeisenbanken and their 30 million clients. The DZ Bank headquarters are the Westend Tower and the City-Haus at Platz der Republik. The DZ Bank Group includes Union Investment, DVB Bank and Reisebank, which are also headquartered in Frankfurt. It is located in the city centre at the Börsenplatz. Deutsche Börse's headquarters are formally registered in Frankfurt but it moved most of its employees a high-rise called "The Cube" in Eschborn in 2010, primarily due to significantly lower local corporate taxes. Level 3 Communications — internet service provider with German headquarters in Frankfurt. Alongside the university is the banking academy Frankfurt School of Finance & Management, formerly known as the Hochschule für Bankwirtschaft (Institution of Higher Learning for Banking Economics), with its campus in the Ostend (Eastend) neighbourhood. In 2001, it became a specialist institution for Economics and Management, or FOM. Frankfurt is host to the classic cycle race Eschborn-Frankfurt City Loop (known as Rund um den Henninger-Turm from 1961 to 2008). The city hosts also the annual Frankfurt Marathon and the Ironman Germany. In addition to the former, it is one of 13 global host locations to the J.P. Morgan Corporate Challenge , Germany's biggest corporate sports event.